Here is a quick demonstration video of my BeagleBone Black (BBB) and the LCD7 cape interfaced to an Arduino controlling an LED. The LCD7 cape is a 7 inch 800×480 LCD with a resistive touchscreen. This entry was posted in Electronics on June 6, 2013 by stephen. 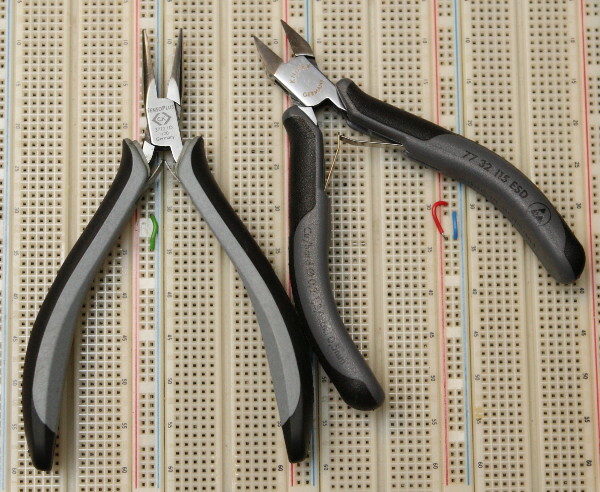 Small precision pliers and side cutters are essential for electronics work. I’ve owned and used the pliers and cutter pictured above for a few months now. I found them to be really good. The cutter is a Knipex 77 32 115 ESD, and the pliers are CK Tools 3772-1D-120. Both feel really good in the hand, have nice spring, top quality construction, have ESD handles and they both use the highly durable box joint construction. I chose the version of pliers with serrated jaws as they give better grip comapred to the smooth one. The cutter is rated for cutting copper wire of diameter 0.3 to 1.3 mm.